The World Water Day was observed with the theme ‘Leaving no one behind’, in Leh on March 22. It was organised by Ladakh Ecological Development and Environmental Group in collaboration with Public Health Engineering Department, Leh. The main theme was how to conserve water and putting a check on water wastage. Sachin Kumar, ADC said, “The main reason to observe this day in the main market was to create more and more awareness among the people. Basically, we have been celebrating this day since 1933, but it is symbolic. When we talk about Leh as a district, increased population pressure, tourists and hotel and guest houses put a lot of pressure on the scarce resources. The question is whether the water in recharging in that proportion or not?”. Talking about the future plans, Wangail Phuntsog, AEE, PHE, Leh said, “We are going to install metering system which can work in Ladakh's harsh climatic conditions. We are also looking for new technologies so that the water supply could be fully accessible to the people of Leh town. We have two major projects that are going on for Leh town for the augmentation of the water supply system”. He informed that the PHE Department alone had dug more than 1,300 bore-wells/hand-pumps and handed over to public in Leh district. They have provided water facilities in the far-flung areas like Rupsho, Kharnak and Samad rokchan in Changthang. He urged the public to use water judiciously, and said that they came across cases where people exploit groundwater using electricity, which wastes energy as well. Recently, the Municipal Committee, Leh, decided to impose strict regulations on the new hotels and guest houses and made it mandatory for every hotel and guest houses to have a septic tank and clean it twice a year. Fariha Yousuf, Training Assistant, LEDeG, said, "We did a survey in the summer season with the help of PHE department and found that the estimated total demand of water from tourists, locals and migrant labours is approximately 5.0 MLD out of which PHE is already supplying 4.9 MLD, and 25% of water is wasted. They are covering almost 97 per cent of the demand". 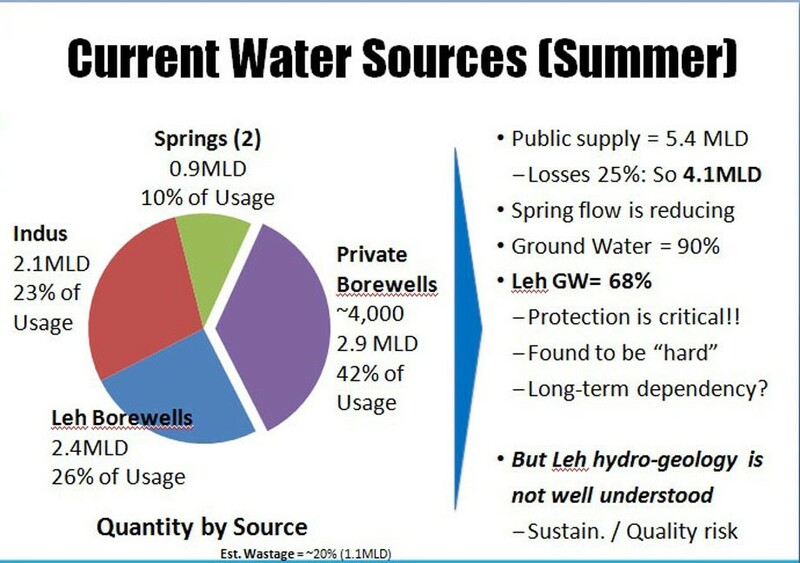 The LEDeG data mentions that the total supply is expected to grow by 12 MLD in 2022 and 15MLD in 2027. “If we talk about crisis, actually we don't have a crisis. It’s a mismanagement happening between the PHE and the local people”, Fariha adds. Dr Iqbal, DHO, while briefing about water-borne diseases, said that contaminated water could cause many types of diarrheal diseases, including Cholera, and other serious illnesses such as Typhoid, and Dysentery. “In order to make the public aware of water hygiene, we have sanitation and nutrition committees in 14 revenue villages of Leh district. They conduct monthly meetings to review the sanitation condition of a particular village and also review the water quality,” he added. In the absence of a policy and strict regulations, the challenges are bound to increase every year. Unless urgent measures are taken to save water, we are staring at a parched future!